A warm welcome to our 2 Principals in Vietnam - Helen Cruickshank-Cowie and Ruth Mortimer who completed their initial trainings in Ho Chi Minh from 02/09/2011 – 07/09/2011. Both Helen and Ruth lived in Hanoi for 3.5 years and have taught English to Vietnamese kids, directed and performed plays in Hanoi. 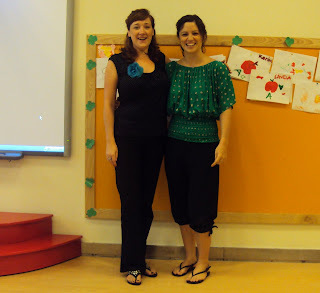 Helen from Scotland is not only a great English teacher, she is also a fabulous dancer. A treat for us during the training breaks as she waltzes, rumbas and swings! Ruth hails from London and was creative advisor and coach for a TV talent show in Hanoi "Lets Get Loud". Effective from September 2011, Helen takes charge of the drama program for the whole of Vietnam while Ruth oversees Hanoi. See the pair in action as they co-teach a demo class of 12 Vietnamese and 5 Korean children in "Spider Island".